Booming Tree is a contemporary drum duo, founded by Gregory Hideo Shimizu and Twilla MacLeod in 2008. Known for their innovative combination of taiko, percussion and vocals, they have performed across North America, from New Orleans to Yellowknife, and from coast to coast in their unique duo format. 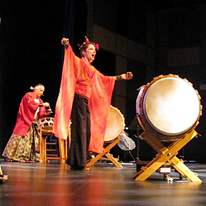 Booming Tree’s work is firmly rooted in traditional Japanese taiko, and their high-energy performances are steeped with stamina and endurance. They play to celebrate the strength, power and resilience of the human form. In addition to their work as a duo, Booming Tree regularly embarks on unusual collaborative projects with other musicians and performing artists. In the past they have teamed up with choirs, orchestral ensembles, dance companies, solo artists, cultural groups and work within styles of music. Booming Tree was recently named as the inaugural recipient of the Westbury Family Fringe Theatre Award, which supports the development of a brand new theatrical production with the goal of touring. Because of the generous provisions of this award, Booming Tree’s piece, “A Man Draws A Bird” will premier in May of 2019 as part of Edmonton’s theatre season. To evoke the primal origin and scope of human emotions, giving voice to that which words cannot express.